Maintaining a proper chemical balance in your pool is of vital importance to it’s longevity, ease of care, and ultimate cost in maintaining your pool. Simply filling your pool with water out of the garden hose works if it seats 2 and is meant for children to use on a warm afternoon. Doing so on a full pool will not only take about a month to fill, but also you will see very fast why pools are kept at a carefully balanced chemical level. Air and waterborne algae spores constantly coming into contact with your pools surface, and once there, and without a chemical system to keep them in check, they begin to spawn rapidly. Leading to blooms causing your water to start to change color, but also add health risks to anyone using your pool. Even bacteria and other stuff found on the human body, when in contact with the pool water and left untreated, has the potential to wreak havoc on your pools water ecology. When becoming a new pool owner, one of the most confusing to understand processes can be proper water balance. Due to the many factors involved it is a serious undertaking to know where your levels should be. Our qualified technicians have dedicated a lot of time and effort in the field to learn and memorize every aspect of chemical balance in order to provide you with the cleanest, safest, and most crystal clear swimming water you can come by. We don’t only offer it, we guarantee it with our Full and Partial Service programs. It is important to know that the balance in your pool is essential for Safety. With a chlorine producing salt based pool, or chlorine tablet pool, your pH levels must be in the safe zone. The reason for such is to ensure that the chlorine in your pool is doing it’s job killing bacteria and germs that work their way into your pool system via the air, or on the skin of your swimmers. Without properly working chlorine in your pools system, you open it up to various troubles such as an unclean pool, algae blooms, or even E. coli outbreaks. Yikes! So what exactly is measured to have “balanced” pool water? Alkalinity and pH levels work cooperatively, so to speak. The higher level of alkaline in your pool, the higher the pH level will be, and vice versa. A properly balanced swimming pool should be sitting at a total alkalinity (TA) of 100 parts per million (ppm). Your water’s pH level is what describes it’s acidity, and baseness. 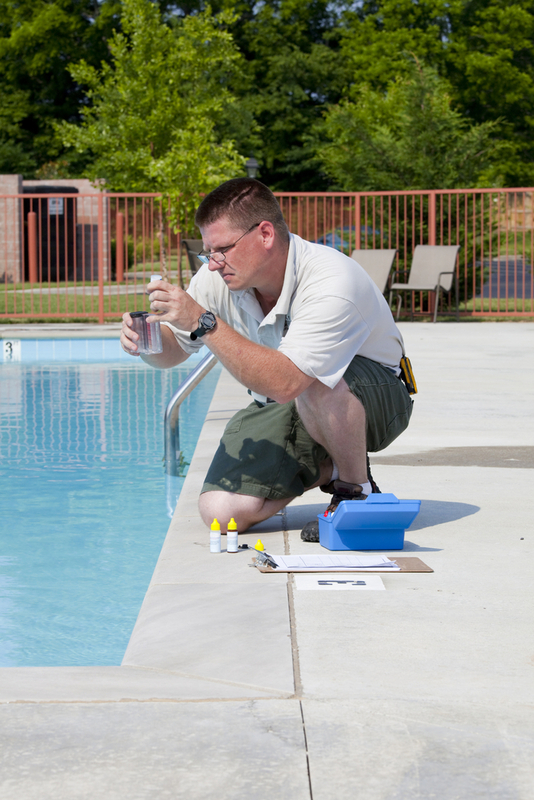 A proper pH level is essential in maintaining your pools equipment and finish unblemished. It is also important to keep balanced as your pools pH level also directly effects the productivity of your chlorine. If the pH is too high, the chlorine essentially stops working, and if it’s too low then the chlorine dissipates too quickly. Your pools pH level should be around 7.4 to 7.6 if testing with a test strip. Anything lower than 7 or higher than 8 runs the risk of the too low/too high scenarios mentioned above. Calcium is critical to your pool water. It essentially works to keep waters natural erosive nature at bay. If your calcium level is too low, than the pools water will begin to erode the lining of your pool, which can lead to cracks, or erode out minor chips to become worse problems. Those scenarios can lead to black algae, and a host of other costly issues. If the calcium level is too high, your water becomes cloudy and starts to scale your pool.